Iran's president said his country has no "moral" obligation to stop enriching uranium as support grew for a resolution reprimanding — but not punishing — the country for blocking a U.N. probe of its nuclear activities. President Mohammad Khatami stopped short of saying Iran will resume enrichment, or will stop all cooperation with the International Atomic Energy Agency. But he said Iran would reject any resolution from the agency's board of governors that strongly criticizes Iran. "With the ongoing trend, we have no moral commitment any more to suspend uranium enrichment," Khatami told reporters in Tehran. "Of course, we don't declare that we want to do something ... it also doesn't mean that we are withdrawing from (the Nuclear Nonproliferation Treaty)." In Vienna, Iranian chief delegate Hossain Mousavian said his country had "no option" but to continue working with the nuclear agency. But he suggested Iran could terminate talks with France, Germany and Britain — the authors of the draft resolution — on future sales of nuclear technology to his country in retaliation for the tone of the document, which he called "counterproductive for the continuation of cooperation." The three European powers have held out the prospect of such sales if Iran agrees to scrap its uranium enrichment program. Iran has instead suspended enrichment but reserves the right to resume them — a threat implied by Mousavian on Wednesday. Khatami addressed the same theme in Tehran. 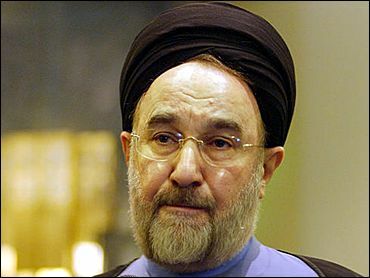 "If the draft resolution proposed by the European countries is approved by the IAEA, Iran will reject it," Khatami said. "If Europe has no commitment toward Iran, then Iran will not have a commitment toward Europe." Reacting to Iran's threats, chief U.S. delegate Kenneth Brill accused Tehran of engaging in a "full-court press of intimidation" to sway the IAEA meeting to tone down the language of the draft. Diplomats representing some of the 35 nations at the IAEA board of governors' meeting said the draft resolution would likely be formally accepted by the meeting later in the week. While lacking direct threats of sanctions, the toughly worded document maintains pressure on Iran to come clean on aspects of what was a covert nuclear program for nearly 20 years until it was discovered two years ago. The new draft toned down demands on Iran to abort plans to build a heavy water reactor and slightly modified language taking Tehran to task for hampering the IAEA probe. One key phrase "deplored" Iran's spotty record on cooperating with the agency — strong terminology in diplomatic language. Other omissions by Iran are noted with "concern," or "serious concern." The draft contained no deadline or "trigger mechanism" as sought by the United States and its allies that could set into motion possible sanctions if Iran continued its foot-dragging past a certain date. Still, in an apparent nod to the United States, Canada, Australia, the draft noted the "the passage of time" — a year since the IAEA probe began — and the continuing gaps in information about Iran's nuclear program. The draft appeared to echo sentiments Monday by IAEA chief Mohammed ElBaradei, who said Monday in unusually blunt comments that his agency's probe "can't go on forever." One diplomat familiar with the American stance said the draft "wasn't all they were hoping for, but it's something they can live with." Another diplomat — speaking like all delegates on condition of anonymity — told the AP Washington recognized it could not now get majority board support for a direct or implicit threat of U.N. sanctions. Instead, he said, the Americans were waiting for new revelations about Iran's nuclear program to surface at the next board meeting in September. That could increase support for declaring the country guilty of contravening the Nuclear Nonproliferation Treaty. That, in turn, could result in referral to the U.N. Security Council, which could impose sanctions. Enriched uranium traces found at military sites in Iran are being analyzed, and those results could provide the trigger in September, said the diplomat. Iran, which denies working on enrichment beyond the experimental stage, says minute finds of enriched uranium were inadvertently imported in purchases through the nuclear black market. The traces include minute amounts at weapons-grade levels. Under growing international pressure, Iran has suspended uranium enrichment and stopped building centrifuges. It also has allowed IAEA inspections of its nuclear facilities without notice. But recent revelations have raised new suspicions. An IAEA report, written by ElBaradei, says Iran inquired about buying thousands of magnets for centrifuges on the black market — casting doubt on Iranian assertions that its P-2 centrifuge program was purely experimental and not aimed for full uranium enrichment.